Rockman Corner: New Mega Man Cartoon to Air on Disney XD; Stars an "Optimistic Blue Bomber"
New Mega Man Cartoon to Air on Disney XD; Stars an "Optimistic Blue Bomber"
Nerdist: What do you hope the folks take away from this new iteration? Steven T. Seagle: Oh, gosh, I don’t know. They should have fun. It’s a fun show. What Duncan really hit on the head is that so many of the characters we’re surrounded by are cynical and they’re not just doing the right thing just because they want to be heroes. Like, we’re overcomplicating these characters all the time for younger audiences. He’s just a fun, optimistic character who screws up a lot and is trying to figure out his way. He’s not perfect, but he wants to do the right thing. JC: We’re spending more time with Aki, the human side of the character, and we mentioned that so we can come clean that it has a little more than the fighting element. It’s got some life in it. DR: And, you know, like Steve said, there are plenty of darker elements. It’s still very fun, but we aren’t shying away from some more heavier elements in it. I think it’s about time we have a character who just does the right thing. DR: So I was just going to add one other thing: He’s a very positive character and it’s just good timing to have some characters out there that are just about doing the right thing and trying to be good. Joe Casey: No, but the hundreds and hundreds of robot villains are those guys. Man of Action goes on to talk about their influences, art style and character designs, the presence of Mega Man's family, classic Robot Masters (including new female baddies) and a little bit about Capcom's involvement. For the full scoop, you can check out the complete interview at Nerdist. He used the word "rebirth" when he talked about the 30th anniversary, I guess we all expected that for the next game and not a sequel to one of the existing series, at least is how I read it. Gee, I wonder if this iteration of MegaMan "does the right thing"
I know right? Like Mega Man didn't do the right thing before? I think I understand where the cynicism is coming from--most shows I've seen recently are written with a lot of snark or sarcasm, satire or not--but unless they start naming names, I can't be sure what characters they're talking about. Fan man, Shock man. What? My fear is, old farts like me showing too much negativity and getting the project smashed before it can generate enough revenue. I want this to succeed because I like new shows, games and toys that me and my kid can enjoy. Even if more emphasis is placed on the younger generation. If it ends up being good, I will gladly support it. If it does not, I do not want it to succeed. Exactly this. If it's good, it deserves success, but there's not going to be any free passes. People supported Teen Titans Go! and look how it ended. A show about sexual innuendos involving characters legs and thighs and jokes about cakes and farts. It's run by different people, i know, but taking a simple concept as Megaman and twist it to make it "cool and modern for the kids!" is not the right way to introduce someone to the series. Ruby Spears did the same and the show (in my honest opinion) was a train wreck. Just keep playing those Megaman games with your son and tell him how you grew up with its games. Just have some father and son moments with your kid instead of making him watch some garbage that will make him ask when he grows up: "Why do they keep calling him Rock? It's Aki!" Fan Man? Shock Man? They are not things that exist. Shock Man is a fan game character. Who exactly is running this show? Jesus. Q: "What do you hope the folks take away from this new iteration?" A: "Oh, gosh, I don’t know." First words out of the man's mouth. Gives you a really good feeling, doesn't it? Oh, gosh, he kinda sounds Canadian, eh. This show is gonna bomb so hard... It's gonna create peace times. Lol, I'm fairly certain there are no Fan Man or Shock man in the Classic games. Maybe they were thinking of Air Man and Spark Man? I did like it when they said they will not shy away from heavier stuff, that is a good sign. Overall, I'm still waiting to see what it is going to be like. I hope they will make a good show. I guess we are all just gonna have to wait and see what comes of this. I really hate to just jump on the hate train before the show even airs. Yeah I'm not excited about this new premise or the art design or this infamous "mini mega" thing, but it is what it is. The complete outrage I felt when the first image came out has dissipated. I don't think the entire MegaMan franchise will be completey soiled be this little blip. Its really not worth getting an ulcer over. I will leave final judgement until I officially view the first episode. Glad I'm not the only one who noticed the Fan Man, Shock Man, AND Elec Man bit. Not sure what was exactly said, maybe he was joking somehow, but if he REALLY believes there was a Fan Man and Shock Man in the series, then this is looking grimmer than ever. Sure, it's a small thing to take away from the interview, but it's a very large red flag. Especially after all they've said about working closely with Capcom and taking years of source material into consideration. Of course, Capcom aren't wanting to think about the series themselves this time, so they're probably okaying a lot of things to appease MoA and make the process easier. I'm still holding out for a trailer and some new art. Yeah I don't really understand what he was trying to say either. Honestly I didn't get a very strong vibe that these guys are that familiar with the source material. Just reading the archie comics megaman gives off so much fan love of the classic characters and stories. Even at the end of some of the volumes there are interviews and they really sound like fans. These guys seem kinda like "well its a cool old video game and we are revamping it" it all feels kinda "meh". "Megaman always doing the right thing now" as oppose to what? I definitely wanna see a trailer too, but I don't think that'll be for a while. I have to wonder why they needed the Megaman license in the first place. The audience they're aiming for doesn't know what Megaman is, and the license had to cost far more than it's worth. Wouldn't it have made more sense to make a new IP? Good points. It really is a wonder. At the very least, this needs to be MegaMan: SOMETHING. Not just "MegaMan". This is CLEARLY a different series. Label it as such. A small change like that would make this MUCH easier to accept. Part of me really hopes they surprise us. There's nothing wrong with introducing Mega Man to a new generation. That's how you grow your consumer base. Yeah good point. If they acknowledge they are doing something COMPLETELY different and name it accordingly it would be easier to swallow. Introducing Mega Man to a new generation MAY grow the consumer base. But alienating old fans hurts that. JC: "New takes on old names, for sure, though." So on top of Fan and Shock, be prepared for Aki to take on such classic villains as Speedy Boomerang Man, Lighter Man, Scuba Man, Tree Man, Strong Man, Eskimo Man, Dental Hygienist Man, Ninja Man, Vacuum Man, Submarine Man, Frog Man, Bone Man, Train Man, Snowball Guy On Skis, Vampire Man and, of course, Rock Man. My soul has died a little bit each day after every new post about this show. Yes, I do hope it somehow draws kids back in to revive the brand, but as of now, I just don't see it. They don't need to fix what's not broken. This sounds less to me like a "we love this series let's renew it" and more like "this series was weak we gotta fix it"
That's just what I pull from all this. If they feel there is a need to "fix" the series, it makes wonder what on earth Capcom is telling them about the current state of Mega Man. Sounds like Capcom's description of the IP is really, really pessimistic. Fan man? These idiots don't even know the source material. And the fact that it's airing on disney channel sends a chill up my spine, if Disney somehow bought this franchise I'd go have a nap in the garage with the car on. Yeah they would make it terrible like they did with Star Wars and Marvel! The Marvel disney cartoons range from mediocre (Avengers Assemble) to absolutely awful (USM/Hulk). @HeatPhoenix Hulk is a good show,as is avengers,But I will meet you halfway with Ultimate Spider-Man. Most of Season 1 was kinda bad,as were some eps of Season 2. @Annon Disney ain't bad,it's good. It's the Management that's god-awful. I just hope it gets kids to buy the games; it doesn't sound like something I could watch, but bringing Mega Man (games) back on the map is something we all can enjoy. Actually, if this is the direction things are going, I hope kids don't buy the games. Otherwise, the only Mega Man games Capcom will make from now on will most likely be Aki Light and Friends instead of Legends 3, X9, etc. Depends on the games themselves. The show is supposedly being targeted at people ages 6 to 9. Could mean we are either getting games that are going to be way too easy for the core demographic of the other games, or games that are way too difficult for the target demographic of the show. Capcom is gonna have to work hard to strike a balance. If they even bother trying to find one. Yeah... In a moment of weakness, I was (more hoping than) assuming the ideal scenario: the cartoon exists as a separate entity that will function to generate interest & sales for the likes of ZX3 or Legends 3. I imagine if this were the case, though, it'd be MM11 that gets made, as that's the closest existing series to this new show. That'd still be great for me, despite the fact I'd rather see ZX3/Legends 3; Classic is my favorite. I don't want to write off a tie-in game before it even has a chance to exist, but... It's really at the end of the list of what game I'd like to see.
" Otherwise, the only Mega Man games Capcom will make from now on will most likely be Aki Light and Friends instead of Legends 3, X9, etc." There is no otherwise, Legends 3 or X9 will never happen regardless of this cartoon's success. Time to move on. "There is no otherwise, Legends 3 or X9 will never happen regardless of this cartoon's success. Time to move on." I know it's unlikely that those games will come out anytime soon, but, you know, never say never? Capcom has a tendency to let their series go mostly dormant for years at a time and then revive them without warning. (Such series include Strider, Breath of Fire, Bionic Commando, Street Fighter, Marvel vs. Capcom, Darkstalkers, and DuckTales.) So given Capcom's history I'd say that they may try to release new Mega Man games from their existing series eventually. I'm betting they're using out-of-this-world names like that just to get under people's skins. After the crap some of the MoA people endured on Twitter from irate fans, I wouldn't put it past them to be making up names like that on purpose. Seems to be working, by the looks of it. Great sense of professionalism there. yes, let's piss on the fans who made the franchise big. tell me again how that tactics works for ghostbuster 2016? You do realize that movie had a 70 million dollar loss and is consider a flop? That's what happens when you piss off your longtime fans. Pretty sure that was sarcasm there. It didn't work for Ghostbusters, and it's not gonna work here. "He’s a very positive character and it’s just good timing to have some characters out there that are just about doing the right thing and trying to be good." You mean like... every hero ever? Have I missed something in the last few years? Have we been experiencing a plague of children's heroes that don't care about anything and are just moody jerks all the time? Honestly, what is this person talking about? Every children's hero I could name is all about "just doing the right thing and trying to be good." And tacking on to that, are you saying there's some version of Megaman that hasn't been about "just doing the right thing and trying to be good?" I'm just... so lost... in the logic of these people. sounds like MoA doesn't know megaman at all. "but I think this is the first time and American team gets to be a creative imprint and go, “What would that be like if it was made here in the West.”"
So I guess either Ruby Spears Mega Man means nothing to them or they've never heard of it. "but we just really went through everything and found the stuff that made him what he is and tried to bring that out. Honestly, it’s just trying to be true to the character is what we did." Because the name Aki and being a school robot turn superhero are totally true to his character. I'll wait to see clips of the show but this still doesn't sound promising to me. My thoughts exactly; these guys not only sound like their heads are super far up their butts, but that they just started looking at 3rd party Mega Man posters and bootleg merchandise a few days ago. Are they afraid of him being X and having some complexity? I think it's okay for Megaman to have some doubts. I mean, look at Megaman in the Archie comics...I think he's pitch perfect there for little kids. A "good kid," heroic...but still has some doubts about fighting his brothers/friends, his missing older brother, how Quake Woman's doctor sees robots, etc. Kid's aren't dumb, just inexperienced. It's okay to do some nuance. I agree completely. Archie hit the nail on the head with its character writing. I'm afraid these guys are gonna make this new megaman very flat. Characters need complexity in order to be interesting. And also what did he mean by different family? Are Roll and Dr Light not involved at all? What about Blues? But honestly if the are gonna mess up Mega I'd probably just have them not touch anyone else. Yet Archie's Mega Man is dead while Sonic is still going strong. It makes no sense :( I finally read the last chapters of archie megaman and was like WHY ISN'T THIS GETTING CONTINUED?! It doesn't help that Archie had to run the comic at a time where Capcom was handling the series so poorly even game journalists were referring to it as dead. Meanwhile Sega had Archie work on the Sonic comic when that series was in its prime. Man this interview just shows how little these guys know or care abouth the source material, seriously just read it. Someone should stop this or get in contact with these guys to set them right. Y'know,I could've sworn that these guys explicitly said that they were working with the source material. But then they give us a school setting,Aki Light,Mega-Mini,missnamed Robot Masters,etc. Did MoA just sacrifice source material for their own ideas? At this point,I think so. We'll have to see what comes out of this. I wish they'd release more chracter art. I'm sick of looking at Aki every damn time there's news on this show. This show sounds truly awful, but the true ire will arrive when CAPCOM officially announces that they're publishing a game in coordination with (and based upon) the release of this bastardization. When that game flops, and this horrible series is canceled: we'll see a new low for our beloved Blue Bomber. Poor Rock; he doesn't deserve this. I would hope they resurrect Mega Man universe and Use this version as "Mega Man". The 90's cartoon is a masterpiece. STS: "(...)Honestly, it’s just trying to be true to the character is what we did." I highly doubt that was the intention. I'm seeing some interesting parallels between this comments section and the comments of any Star Trek (2009) trailer. That is: A bunch of you people think this project shouldn't even exist, that the franchise is yours to command and only yours alone. That you are the only target market even though you ultimately failed the brand when it needed you. So is that all that matters, then why the f even use Mega Man to begin with. Just make a new IP and get some cash. Capcom failed the brand harder than anyone else with their constant mishandling of the series. But then Mega Man fans should be used to being blamed for Capcom's mistakes at this point. It's always struggled to make cash. That isn't the fault of those who've been giving it money since the late 80s. A harsh truth some people here are clearly not ready to accept. "Agreed. A harsh truth some people here are clearly not ready to accept." I'm not sure that "truth" is the appropriate word to use... Blaming fans for not buying enough copies is an easy cop-out argument for business executives who don't want to accept responsibility for their business decisions or people who don't like the series anyway, but there's more factors that could be part of the equation. Blaming fans, as in the people who actively support the games, is in no way acceptable. Especially in the case of the Mega Man series. If they went with that, I would be fine with the series, especially if maybe they had a cross-over with Rockman, whose name is Rock. Very unlikely this show will even be semi popular and we still need to wait to hear the voice actors in roles. I think he was just talking about the name.... and yeah Aki sounds wannabe westernese as if it wants so hard to seem Japanese anime but isn't. On the other hand Mega sounds so... Direct like why? Then to be called Mega Man in a transformed state is just cheesy, I always felt this way with Rock and Rockman. but Rock and Mega Man now that works on so many levels, it separates the character and purpose of him before and after the transformation, works with the musical theme but more subtly and pairs with his normal life (as in with Roll). Eh I think I would take Aki over Mega but not by much, Aki is incredibly lame and I would prefer Rock over both by miles. In all honesty, I'm reasonable sure that this show is going to end up being about as good as Pac-Man and the Ghostly Adventures -- which is to say the episodes will wildly vary in quality, but it will be mostly harmless. What would be funny, though, would be if the tie-in game were a 3D action platformer, not unlike the Pac-Man cartoon game or Sonic Boom on the Wii U. Hey, remember that time Man of Action completely redesigned Spider-Man to the point he was no longer recognizable and renamed him Ooki Parker? ...oh wait, that wasn't a thing? Why they didn't post more pictures? I called the Man of Action's version as Mega Man Zoolander because of the way it's staring at us. Look! 'Nuff shown. I would have been so satisfied with that. I'll do you one better. The show still looks like crap. 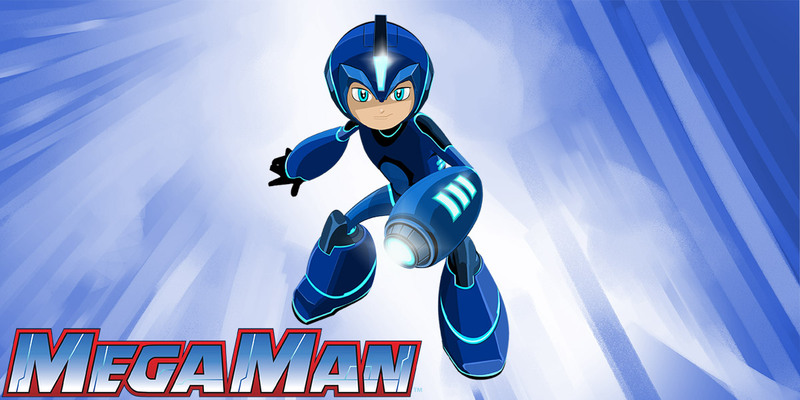 "Megaman" is going to be another carbon-cutout Son Goku, but the show will be 90% Aki Light. Plus expect all the boss masters to have the same millennial-esque cynicism and snarkiness. Yeah, I'll stick with my Ruby Spears' Super Fighting Robots.